As France continues to bask in its World Cup victory over Croatia, the team that triumphantly brought football’s greatest prize back to Paris this week finds itself the subject of debates over identity at home and abroad. Even before the French win in Russia last Sunday, much had been made – albeit mostly outside France – of the fact a majority of the team’s 23 players, including teenage star Kylian Mbappé and Paul Pogba, were children of migrants. Two – Steve Mandanda and Samuel Umtiti – were born outside France, in what was then Zaire and Cameroon, and moved to France as babies. Some African observers seized on this heritage to claim the victory of Les Bleus as one of their own. “Finally Africa wins its 1st World Cup but in French colours,” tweeted Sunday Oliseh, former coach of Nigeria’s national side. Noah responded on air, defending his original comments and countering Araud was in fact denying the identity of the players. But Araud was conveying what many in France felt about the attempts to project a particular type of identity politics on their victorious national team without adequate knowledge of the context. In the two decades since France last won the World Cup with a team celebrated as “Black, Blanc, Beur” (black, white, Arab – a reference to the French tricolor), several politicians and demagogues of the far-right – including National Front founder Jean-Marie Le Pen – have queried the “Frenchness” of the national squad because of the players’ colour. Only seven years ago, the French Football Federation was accused of attempting to limit the number of players of African descent by applying a quota system in training academies. When the national team has been embroiled in controversy, some of the criticism of certain players has included veiled references to their roots overseas. For many in France, then, describing the French win as a victory by an “African team” is too close to the racist rhetoric of the far-right which has been gaining electoral ground in recent years. Emmanuel Macron may have beaten his far-right challenger Marine Le Pen to the presidency but her party secured more than 33.9pc of the vote, setting itself a new record in a presidential election. Race and ethnicity remain a particular taboo in France: neither is measured in the census and recently the word “race” was removed from the constitution. As a result, there is no equivalent in France to the hyphenated identities of, say, the US. This, however, has created a situation where attempts to discuss racism in France can be too easily shut down when difference is not acknowledged in the first place. 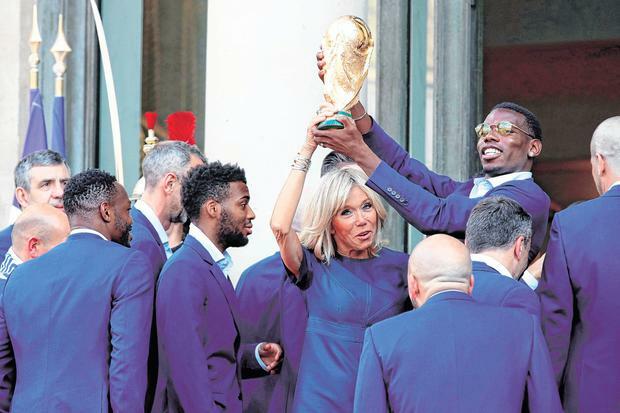 For their part, those on the French team – whose raucous homecoming this week included Pogba leading his teammates in song on the steps of the Élysée Palace with Macron beaming on – with roots abroad rarely make an issue of it. Several make a point of reiterating their “Frenchness”. Pogba has regularly yelled “Vive La Republique, Vive la France!” in press conferences and receptions since last weekend’s triumph. Meanwhile Mbappé, whose name now adorns T-shirts and other souvenirs with the slogan “Liberté, egalité, Mbappé!” has announced he will donate his World Cup fee to charity because, he says, it is such an honour to play for his national team. In a France struggling with several challenges, not least the menace of the far-right, celebrating the “Frenchness” of the winning World Cup squad can be a riposte to the bigots but it should not obscure difficult questions about racism at home.